The lush green fields and rolling hills of Tuscany are one of landscape photography’s most iconic scenes. The area around Val d’Orcia has attracted photographers and artists for years and it’s easy to see why. 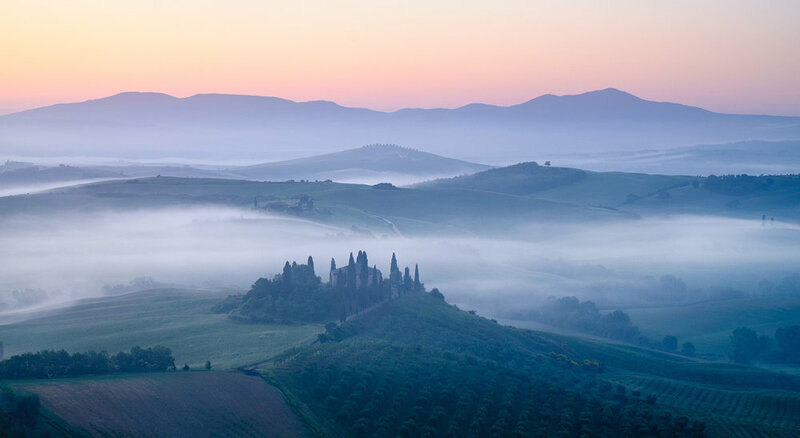 Mist filled valleys and cypress tree-lined roads are everywhere you look, picturesque hilltop towns and vineyards, Tuscany is a beautiful landscape that you can’t help but be seduced by. May is the peak time to visit when the grass is at it’s most lush, the fields have yet to be cut, and the countryside is bursting with wildflowers. At dawn mist regularly fills the deep valleys creating a dreamy landscape that’s incredibly photogenic. We base our workshop in the beautiful medieval town of San Quirico d’Orcia, just a few minutes drive from some of the areas most iconic scenes like Cappella di Vitaleta and the famous Cypress trees, while the Belvedere farmhouse can be photographed from a wonderful vantage point within the hotel grounds. But there’s much more to the area than these well known locations and everywhere you look, particularly in the warm low light of sunrise or sunset, will inspire and fire your creativity. All our workshops are designed to ensure that you can focus on photography while we take care of everything else. Airport transfers, ideally located and comfortable accommodation as well as all meals are all part of the package, and of course the tour is structured to maximize your opportunities to get great images whilst improving your skills as a photographer. We use all our experience and knowledge to get you to some of Tuscany’s most beautiful locations in the best light, and in the field we’re on hand to provide as much support, advice or guidance as you want. Having three professional photography guides helps us to ensure that each participant gets plenty of one-to-one tuition and allows us to better tailor each session to your needs. Because of this we can accept range of experience levels from beginners to professionals and comfortably cater to each. Small amounts of walking. Tuscany is gentle landscape and almost all of the locations are accessible by car. This is a standard overview but it’s flexible and which day we visit each particular location will be decided depending on the weather and conditions. We will however ensure that we visit all of the locations listed below. At this time of year sunrise is before 6h and sunset around 20h30 so we try to build in periods of rest throughout the day to ensure people can stay as fresh as possible throughout the course of the workshop. 16h We’ll pick you up at Florence SMN station and transfer to our hotel in San Quirico d’Orcia. 10h30 After a proper breakfast and a rest in the hotel we’ll head to one of the medieval towns to explore the atmospheric streets before having lunch in a local restaurant where you’re invited to try the famous Brunello di Montalcino wine. 15h30 Relax back in the hotel followed by a post-processing session. Looking at getting the best from the images we took in the sunrise session early in the day. Our post-processing sessions will be tailored to suit the differing levels and requirements of our clients and can range from Lightroom basics through to Photoshop Luminosity Masks and more advanced techniques. 5h – 7h30 Sunrise shoot in Val d’Orcia at a different location from the previous day; Belvedere farmhouse, Cappella Vitaleta or the Terrepille fields. Once again we’ll set off around 5h to make sure we’ve got plenty of time to set up and find a great composition before the best light before heading back to our hotel for a well-deserved breakfast at 7h30. Because of the late nights and early starts we’ll always follow breakfast with an hour or so break to allow people to get a little more rest. 14h30 After lunch in town we’ll make a choice on what to do depending on the weather. 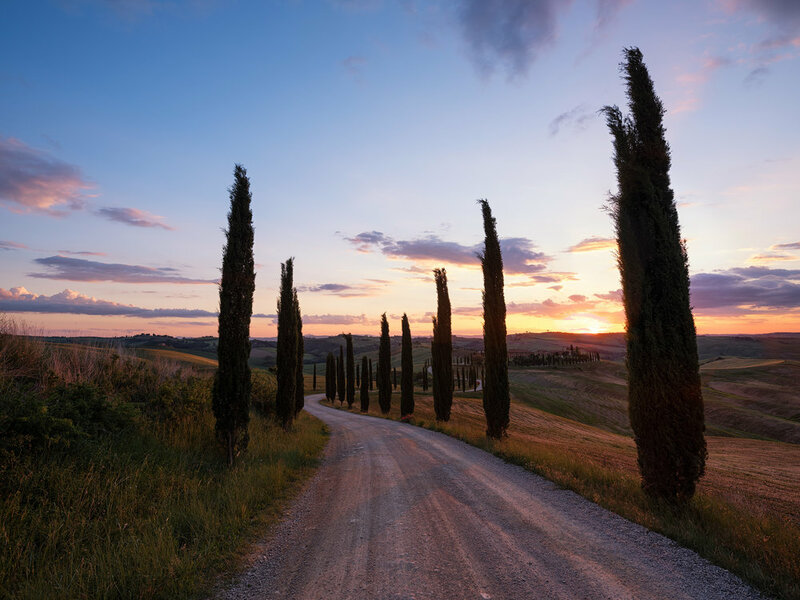 We may head out for a walk around one of the local medieval towns like San Quirico, Montalcino, Pienza or Sorano, or alternatively we might head out into Val d’Orcia to explore new locations or visit well known ones like the tree lined road of La Foce. 18h30 We’ll head out for our sunset shoot at one of the many beautiful locations nearby. We might visit the cypress trees just outside San Quirico d’Orcia which is an interesting area and worth taking the time to explore a little before settling on which composition to shoot when the light is at its peak. Alternatively we might choose to head to Cappella di Vitaleta to shoot it up close from the cereal fields in front. 5h – 7h30 Sunrise shoot in Val d’Orcia at a different location from the previous days; Belvedere farmhouse, Cappella di Vitaleta or the Terrepille fields. Once again we’ll set off around 5h to make sure we’ve got plenty of time to set up and find a great composition before the best light. 11h After breakfast we’ll again evaluate the weather before deciding where to spend the morning. Street photography in one of the local medieval towns like Montalcino, Pienza or Sorano is a possibility or hunting for flower fields and interesting locations in the surrounding countryside. 15h30 After another lunch of fantastic local food we’ll spend some time in the hotel in a comment and critique session. We’ll look at what makes some images work and review some of the images we’ve taken so far during the workshop. 18h30 As on previous days we’ll evaluate the weather and make a decision on where to go for our golden hour and sunset shoot. We’re very close to a number of incredibly photogenic locations, some not so well known like the small stand of four cypress trees surrounding a cross in the middle of a cereal field. 5h30 Our fourth sunrise session gives us the opportunity to repeat one of the nearby locations if we didn’t get ideal conditions the first time, or head out into the beautiful countryside around San Quirico to try something new – there’s so much to shoot here and the possibilities are endless. 15h30 Relax back in the hotel followed by our final post-processing and comment and critique session. We’ll look at getting the best from the images we’ve taken so far on the trip and putting what we’ve learned into practice. 18h30 For our final evening session we’ll head out again to the fields around San Quirico. Depending on conditions and where we’ve shot on previous evenings we'll decide on where's the best place to capture the day's last light. Afterwards we’ll head back into town for final dinner together. Our aim is to take you to beautiful locations and give you every opportunity to get great images while improving your technique over the course of the workshop. From the beginning of your time with us we’ll aim to identify your photographic level and what you’d like to focus on, which combined with having three professional photography tutors allows us to tailor the workshop to your precise needs and provide each participant with plenty of one-to-one tuition both in the field and in the post processing sessions. We also believe that having two shooting sessions a day means that participants get into a shooting rhythm and can quickly put into practice new skills as they are learned. We carefully select the dates of our workshops to try and make sure we are in each location at the best time of year. In Tuscany for example early spring means that the grass has not yet had chance to grow and many of the fields can look a little bare, whilst once we get into June the summer heat starts to turn the grass yellow and many of the fields are harvested. Early May gives us the best chance to capture lush green grasses across the hills and a temperature differential between warm days and cold nights which allows mist to form in the valleys. Our timetable is highly flexible and having a number of fantastic locations all very close to each other means we can adapt to the weather and go where the conditions are best for shooting. This adaptability also extends to the post processing sessions. We believe that editing is an integral part of getting the absolute best out of an image but we understand that the range of participant’s skill levels and familiarity with post processing techniques varies greatly. Because of this we once again make the most of having three tutors to provide editing sessions in the afternoon that can potentially range from the basics of editing a RAW file in programs like Lightroom to more complex techniques like using layers and luminosity masks in Photoshop. Finally, we want to bring you the very best of the place, not only in taking you to stunning locations for photography, but also in introducing you to some of the best food and drink the region has to offer because after all, travel isn’t only about photography. Food is a vital part of any trip to Tuscany, and eating with friends, sharing stories and a bottle of wine is an essential part of our workshops. We aim to make your experience here in the beautiful landscape of Tuscany a memorable one and a trip from which, as well as getting some great images from amazing locations, you’ll also enjoy great food and great company in a very special place. Tuscany is a place where we’ll often find ourselves on a hill shooting with a telephoto lens at a scene across the valley. A telephoto also compresses the landscape and is great for shooting misty scenes. A telephoto zoom that covers 70-200mm (55-135mm on a crop sensor) is perfect. While these lenses are often the least useful for shooting landscapes, for the kind of locations we’ll be encountering in Tuscany there may be a couple of occasions when the zooms listed above are too wide or too long, and a mid-range zoom in the 24-70mm (18-55mm on a crop sensor) is perfect. We’ll often be shooting in low light so a tripod is an absolutely essential piece of equipment. While we won’t be doing any long hikes we’ll certainly be doing some walking over uneven ground, and in the sunrise sessions we’ll often find ourselves standing in long grass which is wet from overnight dew. It’s a little chilly early in the morning before the sun has come up, so a windproof and waterproof outer shell jacket over a warm top will help keep you comfortable. KONSTANTINOS VASILAKIS is an award winning Greece based professional landscape and mountain photographer. His work has been published and exhibited around the world, and he has been organising and leading workshop for over five years. Konstantinos’ work stems from his passion for nature and his drive to capture images that are a personal representation of the scene in front of him, and living in Greece’s northern mountains provides him with much of his inspiration. KOSTAS PETRAKIS is a Holland based professional landscape photographer who has travelled extensively and photographed some of Europe’s most beautiful landscapes. He has over a decade of photographic experience shooting in iconic locations from Italy to Iceland, Scotland to the French Alps, and has been leading workshops for over five years. Kostas’ is inspired by the wild landscape, by the untouched wilderness and by the adventure of exploring new places. For more information, including an overview of the weather, tips on how to get to Tuscany, as well as all the terms, conditions and payment information please download the workshop PDF. For any other enquiries or bookings, please fill out the form below. I spent a fantastic week in Tuscany with Andy, Kostas and Kostantino. It was an incredibly valuable experience toward improving my landscape photography. They provided individualized attention in a relaxed environment that allowed one the freedom to experiment. The non-photography part of the workshop (food, lodging, and travel to locations) was completely hassle-free. Because of my positive experience, I signed up for their workshop in the Dolomites. The Light Explorer’s Landscape Photography Workshop led by Andy in Tuscany was everything I hoped it would be and more! The education and advice was constructive and appropriately challenging and stretched me to focus on the details, implement new techniques and develop my style and goals for my photography. The team of instructors come alongside you from the start and are highly engaging, offering assistance, education and their professional perspectives to help you come away with a successful photographic experience. Each instructor offers his unique insight, which I found encouraging because there are numerous ways to achieve excellent results. Andy and the team were very attentive to the participants throughout the entire workshop. I felt like we were all the best of friends sharing an awesome photographic adventure! Beautiful and inspiring landscapes. Insightful conversations, instruction, and critiques with professionals who openly share their knowledge - just what a great photo workshop should be! Andy and the team took great care of their participants, and this was the best photographic workshop I have experienced. I look forward to future workshops with them. Discovering Tuscany with Andy and his colleagues was a very enjoyable experience for me. Tuscany obviously is an iconic destination for landscape photography, but what made this trip quite special was the mood of the accompanying pros. Not only did we cover great spots, but we did it in a proactive way, being stimulated to discover the very best shooting spots, the best framing and taking opportunity of the best light. Every part of the shooting experience was covered by the three pros with their own angle, from the very technical aspects to the spiritual mood you could adopt in order to boost your artistic creativity. A very complete and stimulating experience I would warmly recommend. Andy, Konstantinos and Kostas are a great team who prepared and ran a workshop which was wonderful both in terms of photography but also entertaining and enjoyable. The mixture of mentality and background within the leading group as well as the participants made the whole workshop a very lively undertaking. Tuscany is a great place to go to, even when the weather is not quite perfect, but the way this workshop is run is unique. Andy, Konstantinos and Kostas provided every support necessary while making photographs in great locations and also on how to process these images afterwards. My highlight was that feedback and critique was provided in a very helpful way. The workshop truly provides great value for money.